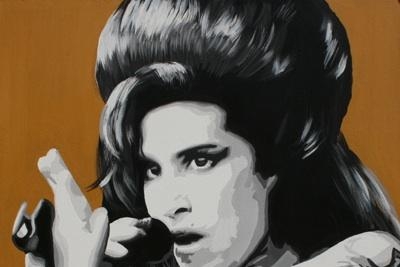 I’ve seen Amy Winehouse perform on TV several times over the past few years – and I was always amazed at how much her voice reminded me of Janis Joplin’s. I was a big Janis fan back in the day, and although Amy’s music wasn’t as resonant for me personally, I do know that for many, she was a ‘voice’ of her generation – and a musical inspiration to many other young soulful artists. I’m greatly saddened by her death. Very few among us could have any idea what it must have been like for a young, blue collar girl from north London to be suddenly faced with international fame; to have enormous wealth and a parasitic British tabloid press watching her every move, hungry for each stumble; to be scrutinized for her looks, weight, voice, career trajectory and personal relationships. We can’t know what it must have felt like, in one’s early 20’s, to win 5 Grammys in one star-studded night, including Best New Artist. Wins that would have had the corporate music industry relying on her as a profitable investment, who would keep churning out hits, touring the world and making prime time media appearances. Perhaps this lends some context to the frustration I feel as I read more and more about Amy and what appeared to be her perpetually recalcitrant attitude about alcohol and drug use – so clearly, and now tragically, summed up in her anthemic hit Rehab. She seemed to understand the potentially tragic pitfalls. She must have watched, just like we all did, when other celebs like Heath Ledger, Kurt Cobain, and of course Michael Jackson, had their lives snuffed out by addiction. Yet in song she was taking the stance of the sad, troubled, yet defiant rebel – I don’t need or want your help. My concern is, as we mourn Amy’s passing and listen to her music with renewed interest, that we don’t romanticize what she was going through – and the fatal decisions she made -- that we don’t make saying ‘no, no, no’ to rehab the cool, badass ‘what would Amy do?’ thing to emulate. Outside her home, fans and mourners gathered to lay flowers – some leaving glasses of wine, bottles of spirits, and cigarettes, as is the practice on Jim Morrison’s grave in Paris. These are worrisome signs of a myth already forming – one with a troubling message. To her credit, she did attend a 2-week treatment program in 2008 which, according to various entertainment news sources, “didn’t take”– largely because effective treatment for drug and alcohol addiction requires far longer than 2 weeks to be successful, in my professional opinion. Entering such a program may have been a bid in trying to get her family, friends, and record company off her back by showing her willingness to go for help. She even spent some time at the famous private celebrity rehab facility The Priory in May of this year – even though she was urged to seek a longer government-provided treatment program, she chose a short assessment followed by ‘outpatient’ treatment at The Priory. I’ve been a therapist treating clients with addictive behaviors for over 20 years – and my hunch is that Amy was fighting some pretty hefty demons that she didn’t think she could conquer. It has been said that recovery from addiction is an ‘inside job’, one that is not for the faint of heart. I wonder if Amy did not believe strongly enough in her own courage and resourcefulness. Rather than face her deep inner pain sober, she opted for the other choice: to say no to effective rehab. When people with mental illness and addictions begin to spin out of control, family and friends discover how powerless they are to ‘make them change’. Even as we try to get them to see realistically what is happening to them – and how it is affecting those of us who love them -- the only real hope is that they themselves will recognize the need for help and go for it. The reality is that many people struggling with addiction do choose to recover -- and some don’t. For the ones who don’t, there isn’t much we can do for them. Unfortunately, some of them end up dying. As a recovering addict myself – one who chose to get help many years ago – it’s challenging for me to understand people who make the decision to keep using, even to the point where it kills them. On the surface, Amy had it all – her life shone like the star she was. She had ‘made it’ – she was young and beautiful, had tons of talent, fans followed her all over the globe. In fact, one mourner keeping vigil outside her Camden home even compared the memory of her, in death, to that of John Lennon – even though Lennon’s death was not due to addiction. Nonetheless, being compared to John Lennon’s musical genius is incredible praise, if you ask me. And so, along with a great many others, I feel very sad today about another young life snuffed out by something that could have been prevented. But I know all too well that recovery from any kind of addiction is a choice – a choice the young Amy Winehouse said ‘no’ to - one time too many. In addition to her musical legacy, it is my fervent hope that the message her untimely death leaves is less a romantic myth – and more a cautionary tale. Amy – wishing you well in the next phase of your journey.